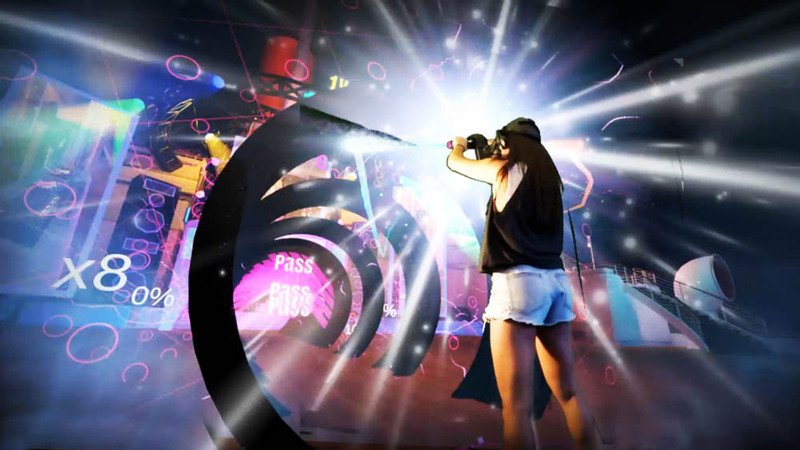 There’s something undeniably compelling about mixing music, movement and virtual reality, and Popstic VR – with a little help from Hotel Transylvania – is trying to do something different with the formula. We chatted with Ryan Pulliam and Morris May from Specular Theory about how some pieces of PVC pipe became a VR game. Tell us a little bit about yourself and the team at Specular Theory. Ryan Pulliam: Morris and I met a few years ago and he taught me how to kiteboard. We have completely different backgrounds; Morris worked in Hollywood for 25+ years as a CG/VFX supervisor and I spent 15+ years in marketing. But we’ve always shared a passion for storytelling and technology. When I first tried VR at his house, I was completely blown away. I quit my job the next day and we started our company, Specular Theory, in 2013. We are one of the few companies that was built from the ground up for VR. All of our technology and tools are custom-built for VR, and we have a team of native immersive creators. Building our tools and team from scratch has given us the freedom to create content for a new medium in an authentic way, and to push the boundaries both creatively and technically. This is something we strive for in everything we do, regardless of category; entertainment, training, e-commerce or gaming. No matter what type of experience we are creating, our goal is always the same – to create and deliver engaging immersive experiences that you can’t achieve through any other medium. Popstic VR is your first foray into game development. So to start with, what is Popstic? Ryan Pulliam: Popstic is a brand, a platform, and a gaming accessory! It’s sort of like the Nintendo Wii of VR, in that we are creating fun games for mainstream audiences, and we have built a prototype accessory (the ‘Popstic’ or ‘Stic’) that easily pops on and off a Vive controller. The Popstic is great because it eliminates the need to hold a controller or press any buttons. It offers a new way to play VR games, and benefits everyone from complete novices to experienced gamers. And we are creating a whole new series of ‘Stic-based’ VR games for music, dance, fitness and sports. We have had a ton of fun working on this, and so far the response has been amazing. Almost everyone who has a Popstic prefers it to their standard controllers, including users in China, Russia, Korea, Canada, and the US. Right now it’s just a prototype made out of PVC parts, but we are working on manufacturing a real consumer product very soon. How did the Popstic come about? Ryan Pulliam: The idea for Popstic was really a culmination of different ideas that Morris and I had been batting around. Morris actually had the idea to create a rhythm game after watching videos about how pro surfers train. They were using different-colored balls in the ocean to improve things like reflex and coordination. I have always been excited about using VR for fitness, so I loved this idea. I had no idea what Morris was thinking in terms of the creative, but I had been thinking about controllers and how much I hated using them. In VR, whenever I have to think about what to press, what combo of buttons to use, and/or when to release the trigger, it disconnects me from the experience. I also started thinking about poi and fire spinning. A few days later, Morris comes into the office with a Nerf noodle wrapped around a broomstick, and he tells me he’s got an idea. Fast-forward to now, and here we are! So to answer your question…. 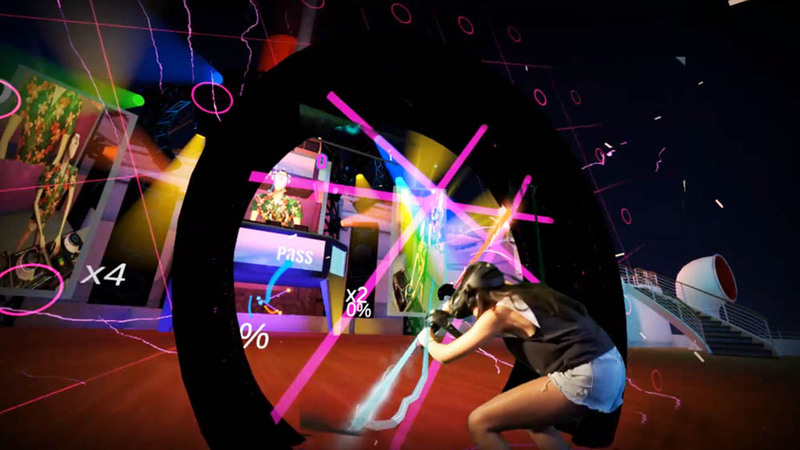 Popstic is a VR gaming platform that’s creating a new category of “Stic-based” games, using our proprietary gaming mechanic and custom peripheral attachment to create endless amounts of gameplay across music, dance, fitness, training, and sports. The games are inspired by EDM, poi dance, martial arts, fire spinning, and flow arts. Hotel Transylvania is a beloved animated film series. Tell us a bit about how this partnership came to be and what it was like working with Sony Pictures to bring Drac and the gang to VR. Ryan Pulliam: We are really excited to partner with the team at Sony Pictures Virtual Reality on this game, and they have been an amazing studio to work with. Most of the successful VR titles have been generated by small indie studios, and we feel this partnership between marks a new shift in the industry, with major studios tapping indie producers to create truly immersive and entertaining content for studio IPs. When you watch the Hotel Transylvania films, there are always fun music and dance scenes. We extended that to our VR environment. 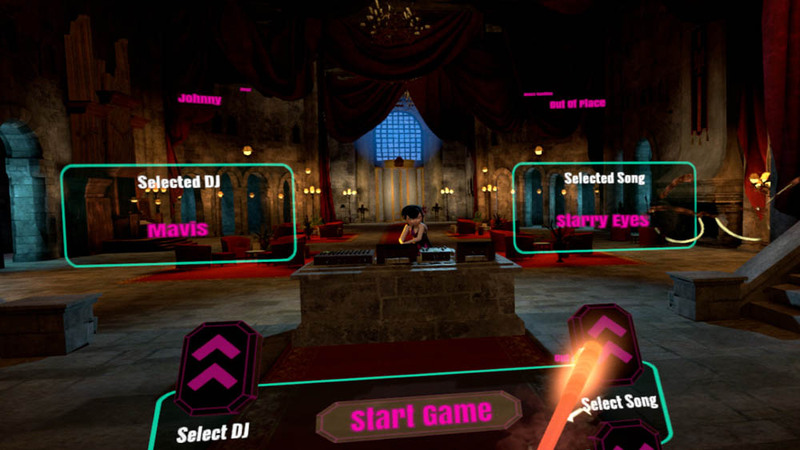 In our game, the characters become DJs, and players can interact with them in a whole new way. It’s fun to think about integrating movies into VR and creating something new and authentic, rather than just recreating scenes from the film. I love seeing the DJs’ personalities – each brings their own style of music and flair. Hotel Transylvania Popstic VR started as an arcade experience. Were there any particular challenges your team experienced bringing the title to homes? Ryan Pulliam: Fortunately we had a pretty smooth launch in the home market. One initial challenge was regarding the Popstic, i.e. how to bring it to the home market. Since the device is a prototype, we wanted to be able to offer it to players but not require it. We solved this by optimizing the gameplay for Wands mode, which uses two standard controllers, but also offering a Popstic mode. This makes the Popstic more of a cool added bonus, and something to make gameplay more fun. Since we are a small indie studio and this is our first hardware product, we also had to figure out shipping and fulfilment. Fortunately we had some things figured out from when we launched the game for arcades. Right now the item is backordered, which is a good challenge to have, but it’s something we are working to improve. It’s great to see that so many people interested in playing with it! Now that Hotel Transylvania Popstic VR is out, both at home and in arcades, have there been any user responses that surprised you? Morris May: Honestly, not really…. we tested it quite a bit and are happy. We were surprised by how many people were holding the Popstic incorrectly at first, but we were able to quickly fix this in our outreach. Since it’s also a really fun workout that gets your heartrate up, we are surprised that we haven’t seen more workout comments. But we just launched, so maybe we will see that soon. How many people worked on Hotel Transylvania Popstic VR and how long was the development process? Morris May: We have a small full-time team (less than 5). We started developing Popstic as an in-house passion project about a year and half ago, but had to put it on hold while we focused on other pieces. When the opportunity came up to partner with Sony and make a Hotel Transylvania themed version of the game, we were able to integrate the assets and complete development on a pretty fast timeline. Are there any updates planned for Hotel Transylvania Popstic VR that you can share with us? Morris May: We frequently make updates based on the feedback we receive from the community. The latest updates have included minor tweaks, like being able to see the song title during gameplay, up to major ones like adding whole new levels: Extreme Mode and Death Mode. We also have some big updates that we will be announcing soon… be sure to follow us on social media @popsticvr on Twitter, Instagram and Facebook to stay up to date on upcoming news and fun giveaways! Sony sent us a ton of Hotel Transylvania swag which has been another awesome benefit to partnering with a major studio/IP. Where can people get one of those awesome Popstics? I’m very tempted to build one out of a broom stick after seeing your prototype! Ryan Pulliam: Haha, yes it’s exciting to see how far we’ve come! You can purchase a Popstic prototype on our website at www.popsticvr.com (note, it currently only works with the HTC Vive controller). Or if you are feeling extra creative, we encourage anyone to make their own Popstic and share their creations with the community! Tag us @popsticvr or use the hashtag #popsticvr to share on social. What’s next for Specular Theory? Morris May: We are working on a series of new games and Popstic titles, some with big IP and some original titles. We also have an exciting multiplayer game we are working on. Thanks for talking with us, guys! Hotel Transylvania Popstic VR is available on Viveport, and as part of Viveport Subscription.